Leading Wholesale Trader of mcb protected socket, havells distribution board and distribution board from Delhi. We have been trading and supplying the MCB Protected Socket. The offered socket is suitable for surface mounting on walls. 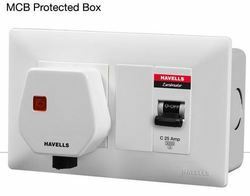 Our offered socket is available with a cover, which protects it from accidental damages. The offered socket is compatible for all the standard sized plugs of electrical equipments and machines. Our offered socket facilitates easy and swift electric connections for the electric appliances. We have been engaged in the trade and supply of Havells Distribution Board. 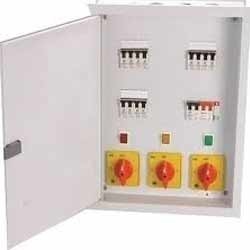 The offered distribution board is a panel board which divides an electric power feed into the subsidiary circuits. 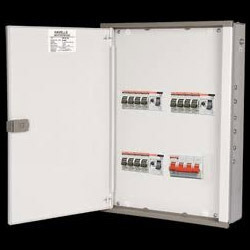 Our offered panel board can accommodate fuses and electric circuit breakers. The offered board is designed for the seamless electric performance in fluctuating voltages and amperages. Our offered board keeps all the electric parts covered behind the panel. We are one of the well known traders and suppliers of Distribution Board. The offered board is a breaker panel for the electrical circuitry. Our offered board pays a very crucial role in the electric supply system for homes and offices. The offered distribution board divides the electric power into the constituent electrical tributaries. Our offered board hides the wiring components and keeps the operator away from live electrical parts.